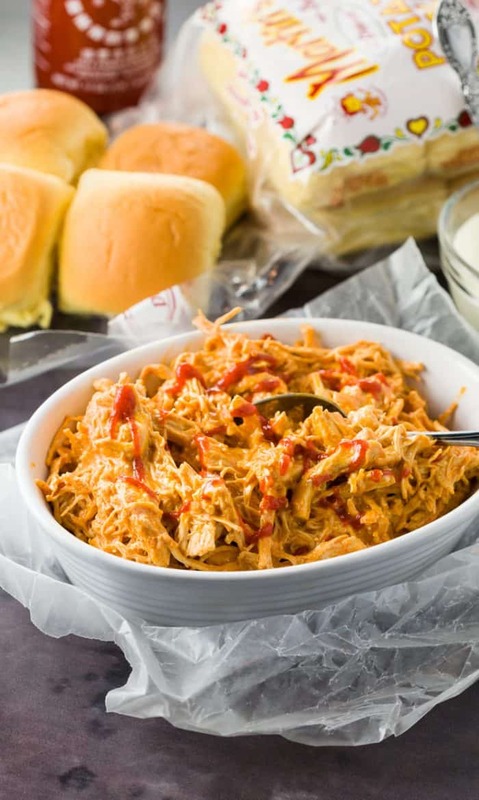 Tender, slow cooker chicken simmers in a mouth-watering honey sriracha sauce for the best sweet and tangy chicken slider recipe. A big thanks to Martin’s Famous Potato Rolls for sponsoring this post, all opinions are my own. So now he has me going through this honey sriracha sauce phase and it’s kind of taking over my life. In a good way though. 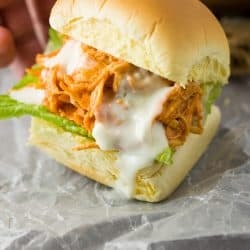 These chicken sliders are completely addicting, and this particular recipe is pretty forgiving. Like if you don’t have apple cider vinegar, it’ll be alright. I do have one request though- and you do have to take me up on it. You ready? You have to use Martin’s Dinner Potato Rolls. Not because they’re kind enough to sponsor this post and support my blog. But because their rolls are flippin’ phenomenal. They’re sweet, and buttery, and perfect. Welp, wouldn’t you know it. Martin’s is a family owned company in Pennsylvania. Thanks to my BFF, I’ve visited there a time or two as well, and they also know their bread. Go figure. 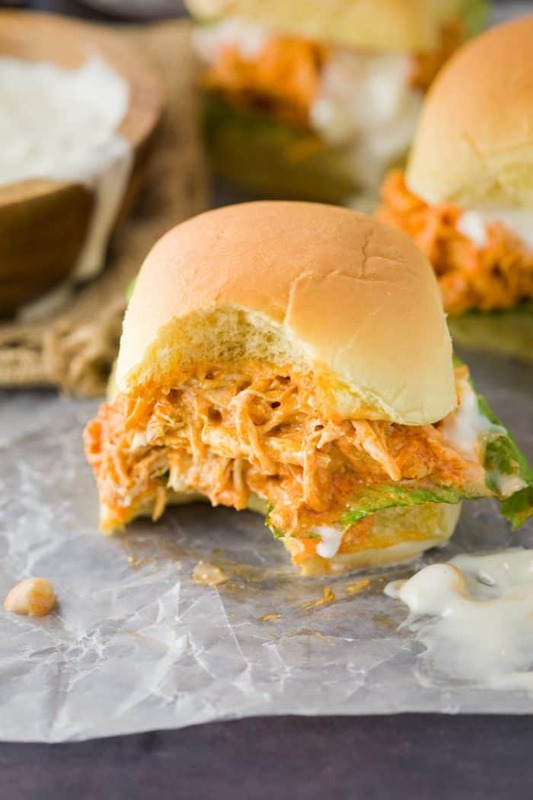 These slow cooker honey sriracha chicken sliders feature tender, slow cooked shredded chicken smothered in a sweet and tangy honey sriracha sauce, placed in a fresh slider roll and drizzled with savory blue cheese. Place the chicken breasts next to each other at the bottom of the crock pot and sprinkle the tops with garlic powder, paprika, and desired amounts of salt and pepper. Place the remaining honey sriracha chicken ingredients around the chicken (not on top.) Heat on low for 4 hours. Then, use a fork to shred the chicken. Stir until the sauce is distributed evenly throughout. Continue to heat on low until ready to serve. To serve, place a lettuce leaf on the bottom of each roll. 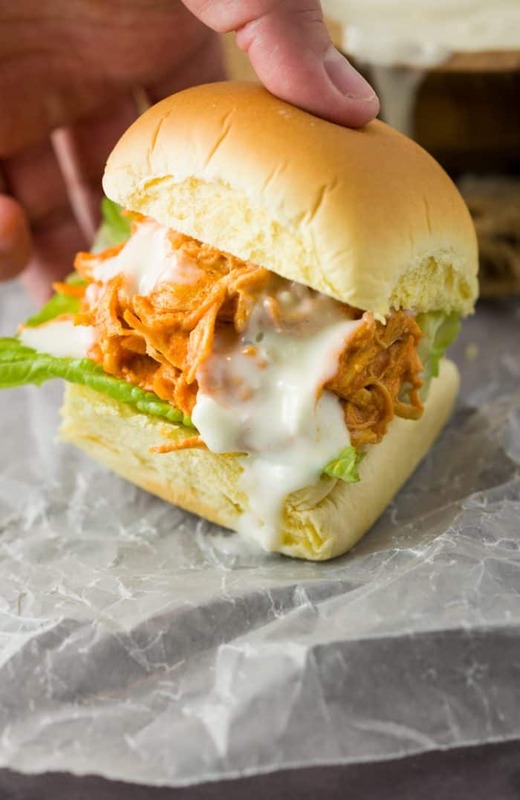 Scoop a heaping portion of honey sriracha chicken onto each slider and drizzle with a Tablespoon of blue cheese. Enjoy! I made this tonight for dinner! It was soooooo good. I even bought the rolls. I added some smashed avocado to the sandwich and served with a side of refried black beams. Hi Kim! Oh my gosh this made my whole day!!!!! I’m so happy you enjoyed it and even got the rolls! Sooo awesome!!!!! Thank you for taking the time to tell me!! What is buffalo sause? Is it Franks hot sause? Frank’s makes a version of buffalo sauce but yes, it’s pretty much the same thing! Can I freeze the chicken with the sauce? Hey Max! You sure can, I do it all the time!! Woo!! !